Our thanks to Docs Not Cops for this guest post on their work and recent concession won from the Department of Health. Docs Not Cops is a group of NHS staff and patients that work to combat racism in the NHS. We are fighting to protect access to the NHS on the basis of need. No one should be afraid to access the healthcare they need, either because they can’t pay or might be punished, and NHS workers should not be forced to police the people they treat. We believe the Government is trying to blame the severe and growing NHS funding crisis on migrants, but this is a distraction. The numbers don’t add up: ‘deliberate health tourism’ costs less than 0.3% of the overall NHS budget [see the Fullfact site here]. The costs that might be recouped by charging people for their care are a drop in the ocean for the NHS, but potentially ruinous for patients now being landed with multi-thousand pound bills – or being put off accessing healthcare altogether. NHS workers shouldn’t be forced to police the people they’re treating. It is costly and time-consuming – and not only does this raise difficult medical ethics issues for already overstretched staff; it will destroy the relationship of trust between NHS staff and patients. 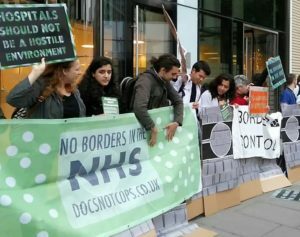 Along with groups like Doctors of the World and MedAct Refugee Solidarity Group, Docs Not Cops have been campaigning against policies designed to deter, restrict and/or charge migrants for access to healthcare. Founded in 2014 to oppose the ‘Health surcharge’ added to visa applications under the Immigration Act introduced that year, the group has more recently been campaigning against new regulations which – as of Monday 23rd October – oblige all NHS trusts in England to check the residency and immigration status of patients and to demand upfront payment for care from those who are unable to prove their eligibility. and held a social media day of action which saw hundreds of people tweet “I’m a patient, not a passport” selfies and #patientsnotpassports trend on twitter for 8 hours. The new regulations cover all secondary care and a large proportion of community and mental health services. Though it does not include GP services or A&E, people may be asked questions in these places and may fear attending them as a result of questioning in other parts of the health system. Campaigners were unable to prevent the introduction of the regulations, but our efforts were rewarded with a small victory on 25th October, when the Department of Health quietly added exemptions for school nurses and health visitors into guidance for implementation of the new regulations. While it is encouraging that the Department of Health appears to have listened to some concerns from frontline workers, the reality is that this policy needs to be scrapped. Marginalised women and children will still face racial profiling and discrimination at maternity appointments, at outpatients appointments and when entering A&E where the checks are being carried out even though charging doesn’t apply. As Bevan noted in his 1952 book In Place of Fear (describing “agitation” about “free treatment of foreign visitors” as a Conservative attempt to “exploit the most disreputable emotions… to discredit socialised medicine”). 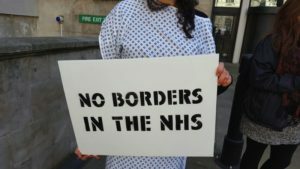 When NHS treatment becomes conditional upon immigration status and financial means, instead of being granted on the basis of need – the obvious risk arises that some migrants will not be able to afford to seek medical advice or treatment, or will fear punishment for not carrying the right papers. Already there have been numerous examples of patients being racially profiled and targeted with threatening letters and demands for payment. London North West Healthcare sent a letter demanding documents to prove eligibility for NHS from an eight-day-old baby. Barking, Havering and Redbridge University Hospitals NHS Trust (BHR) sent at least one pregnant woman a letter threatening that future appointments might be cancelled if she could not pay a deposit for treatment. It is not hard to imagine that the government may seek to extend the conditions upon which access to NHS treatment is available, and we can note that some CCGs are already introducing policies that restrict access on the basis of BMI or smoking while dropping treatments they are willing to provide for free. [To] abolish the legal provisions passed in 2014 requiring certain immigrants to pay for NHS services. Development of legislation ‘as per the NHS Bill (2016-17)’ – as the motions backed at Labour Party Conference in September 2017 stated – needs to retain and extend this commitment in order to overturn the new regulations and ensure access to healthcare on the basis of need. 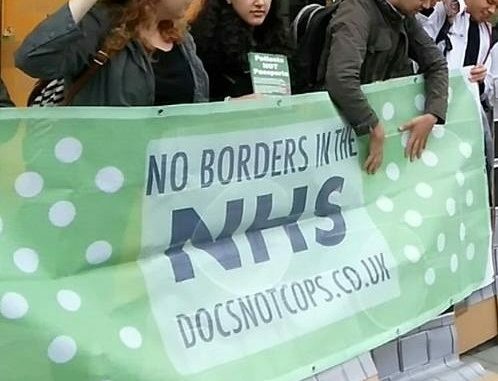 Docs Not Cops will continue to spread information and create opportunities for those who want to defend this core NHS principle and demonstrate solidarity with migrants and people of colour to resist racism in the NHS. Docs Not Cops will be at the Health Campaigns Together conference on November 4th 2017, running a workshop on “Health Tourism and Migrant Rights in the NHS”. The NHS is free for all in need as it was designed, Doctors and Nurses are there to help the sick not ask to see their passport or credit card come to that. Hunt has no right to offer it up for contracts to Private Comanies or Keizer Permenente for profiteering, we pay our National Insurance so should not need to get Medical Health Insurance either, I am retired and have paid for it all my working life, it’s not Hunts to offer to anyone. The NHS can’t just be service on demand when the demand increases all the time, along with the cost of treatment. Far more is now demanded of the NHS than when it was set up, and a quick search for a graph on NHS spending in both real terms and as a percentage of national income clearly demonstrates this. ‘Free for all in need’ sounds fine in principle, but human ‘need’ is potentially infinite. One big problem is that ‘cuts’ (this actually means that spending does not rise quickly) usually translate into cuts to services; but the biggest cost in the NHS is salaries. There are very many non-medical positions, nearly all well-paying and highly-pensioned managerial and bureaucratic positions, that are virtually impossible to cut – this large and well-provisioned strata are the decision-makers within the NHS.